Save 20% Premium 2019 is now 20% off at HRblock.com. Use the above instant coupon when buying from HRBlock.com and cut the price of the Premium version from $49.99 to $37.49. Your order of Premium includes all the features found in the Deluxe version along with Schedule C guidance and tools to help you calculate rental income expenses. Because this offer is activated with the above link, you don’t need to worry about any additional coupon codes at checkout. Save 35% Save 35% on the H&R Block Premium download version. 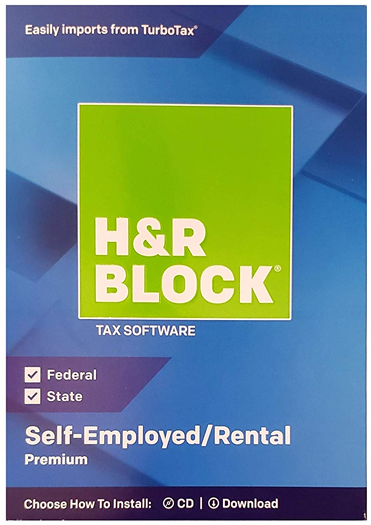 Besides the online versions of, H&R Block gives you the choice of downloading and installing their tax software on your PC. And if you pick up a copy today you’ll save 35% off your purchase. That brings the price down from $74.95 to $48.72. This is a limited time offer – See H&R Block’s site for full details, terms and expiration dates. Now on Sale Find on H&R Block Premium on sale at Amazon. Amazon is currently offering H&R Block Premium on sale with free shipping. You also have the option to choose from the boxed version, which arrives in about 5 days in the mail with the standard shipping, or the instant download which lets you download and install the software directly from Amazon after you complete your order. Sale prices will vary depending on the version you choose and if you need to order the State return as well. No promo code needed as the sale price will be automatically reflected in your order when you follow the above discount link. Free Trial Try out H&R Block Premium free before you get it. If you are new to H&R Block tax software, looking to compare it to the other versions, or wanting to see how this years version compares with last years, then you can head on over to hrblock.com to try it out any of the online versions for yourself – Free! Just follow the above link and it will take you to the selection page and then just choose the version that you want to try. You will be able to go through most of your tax return but you won’t be able to fail anything or print out any forms until you pay. If you decide not to get it, then there is nothing you need to do – Simply don’t pay when it asks you to purchase it. It is hard to estimate number of people who work as freelancers, especially that many of them may still hold a full-time job. Premium Online offering from H&R Block should fit the filing requirements for millions of those who are freelancers or contractors. It’s very easy to get started using H&R Block. Thanks to smart phones, the task of keying in W-2 details has been automated. All it takes is a picture of the W-2 and the software fills out all the required fields – no more guessing where the information should go. Additionally, it is just as easy to fill out the personal details on the tax return. There software can import prior tax year return even if it wasn’t filed with H&R Block. By simply drag-and-dropping the file in the appropriate window, software fills out most of the personal details, such as social security number(s), addresses, employment info, etc. You still have to review it in case there were any changes from prior year, but it is still less work than starting inputting all the information from scratch. This version is also suitable for investors to report annual financial records. This version aids in reporting income generated from stock sales or dividends, mutual funds, bonds, and calculating cost basis for stock purchases and sales. In a nutshell, this version covers Schedule D reporting. Real estate investors can also use it to account for rental property transactions. Cost basis calculations don’t only apply to stock sales. They also include accurate calculations for home sales, and gift and inheritance assets. Reporting mortgage interest and property taxes. Importing the following forms: 1095-A, 1098, 1098-E, 1098-T, 1099-B, 1099-DIV, 1099-INT, 1099-R.
One of the biggest determinants of using H&R Block is the ease of use. The interface is straight forward keeping you informed where in the preparation process you are at all times – Overview, Federal, State, or File. You can go back and forth between the sections and another benefit of using an Online version is that you can work on your taxes across many devices. And if you get stuck and are unsure about the right answer, there is a help center where you can type your question. The same place will display the most common questions for the given section. Last but not least is the H&R Block guarantee of the accurate and error-free tax return you are submitting. Your return is guaranteed to be 100% accurate and if that is ever questioned by the IRS, H&R Block offers Audit Support. That means working with you to understand the notice you received from the IRS and how to craft a response. Finally, there is a maximum refund guarantee. H&R Block will review all the deductions and credits that apply to your tax situation ensuring the highest possible refund for you.